Over the weekend, an Algonquin team that earned a bid in the fall got a chance to compete at Nationals. 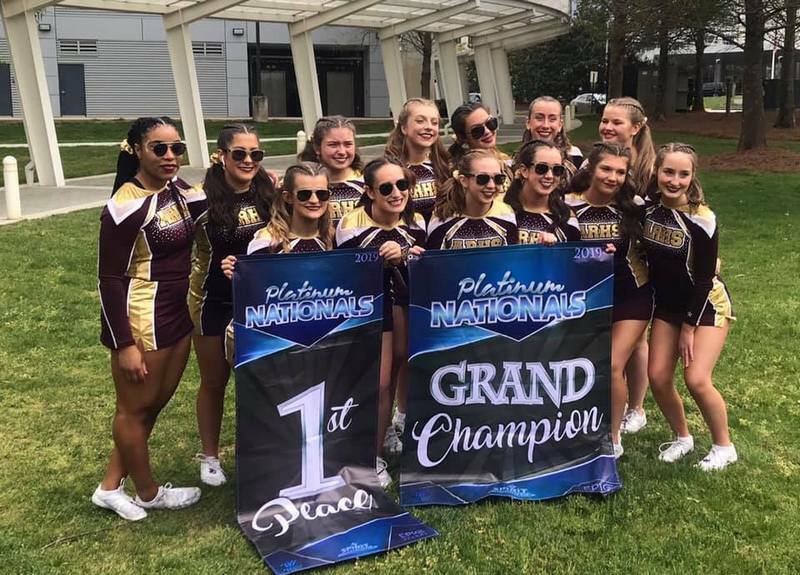 On Saturday, Algonquin was scheduled to perform in the Platinum Nationals competition in Atlanta. I can’t find any official results posted or even school/team tweets sharing news. But a picture’s worth a thousand words. And this one (right) posted to Facebook by one of the team’s chaperones shows the victorious girls holding up 1st Place and Grand Champion banners! Of course, the most of the ARHS Athletics department is focused on the new season. It’s off to a strong start with several teams kicking off spring with wins. On Wednesday, Boys Volleyball beat Minnechaug 3-2. On Thursday, Baseball beat the same school 3-1. On Friday, Boys Lacrosse had a big win over Littleton 10-4. The former Holliston head coach returned to her high school alma mater – where she graduated in 2012 – picked up her first win at the helm of the Tomahawks program – with a 16-1 shellacking over Northampton on Saturday morning in their season opener. . .
Algonquin Regional senior attacker Kate Sullivan is looking to join an elite club this season — the girls’ lacrosse program’s 200-point club. The school’s photographer Jeff Slovin posted better shots of both the Baseball and Girls LAX wins than the ones I shared above, plus great ones of Volleyball. Check out Slovin’s photo albums for Gonk spring sports here. Not every team scored a win. But, even two of the teams that scored losses last week had victories to boast. The Boys and Girls Outdoor Track teams both lost meets to Wachusetts last Wednesday. But, not surprisingly there were some individual achievements. ARHS athletes (including ones familiar from recent Indoor Track victories over the winter) scored victories in the 2 mile, 800m, 100m, long jump and triple jump for the Girls and the 400m, 200m, 100m, long jump, high jump and triple jump for the Boys. Other T-Hawk losses were Softball to Hudson 15-0 and Boys Rugby to Cambridge Rindge & Latin School 29-22. On Saturday, Girls Rugby took part in a big jamboree held at Lincoln-Sudbury Regional. No school’s scores were posted out of that day’s play. Their first regular game is this Wednesday. The remaining varsity teams kick off their seasons this week. Girls Golf’s plays today. (I know it’s wet out there, but last I checked it was still scheduled to go on.) Boys and Girls Tennis openers are this Friday. Now, here are the ARHS varsity games on tap through Patriots Day.